Cost to install video surveillance cameras varies greatly by region (and even by zip code). Get free estimates from CCTV and intercom installers in your city. Cost to install video surveillance cameras varies greatly by region (and even by zip code). Get free estimates from CCTV and intercom installers in your city. 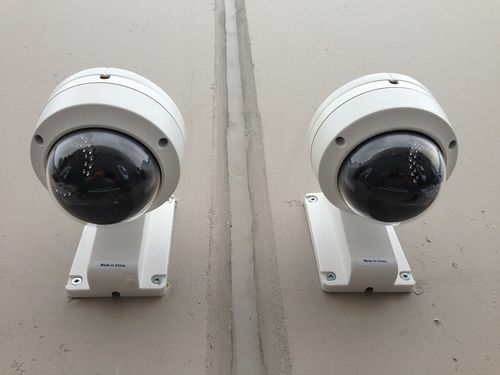 The cost of installing video surveillance cameras is $1,200​. How much does it cost to install video surveillance cameras? Whenever you want to keep track of what’s going on in your home, a video surveillance system can help you do just that. Whether you want to keep track of when your kids are getting home from school, you need to check on a sleeping baby, or you want to be able to visualize your home while you’re away, video surveillance systems can allow you to get a peek inside any room of your home without your needing to be there. There are a lot of video surveillance systems on the market, from simple DIY, wireless systems to more complex monitors with third party tracking. Sometimes also known as CCTV or Closed Circuit Television, video surveillance systems can allow you to track and monitor anything going on inside your home whether you’re there or not. Video surveillance comes in a wide range of forms, from DIY systems that homeowners can install themselves and monitor from their smartphones with costs starting at $60, to more complex systems that include professional installation and monitoring. The vast majority of people today are opting for wireless set ups that can allow for both professional monitoring in the event of a break-in, as well as the ability to view various rooms in the home from tablets or phones. The average cost for this is around $200 per camera with $100 for installation, and a monthly monitoring fee of around $30 per month. Unmonitored systems are available for similar costs, without the monthly follow up fee. Most people install a minimum of 4 cameras at a time, for a total cost of $1,200 at time of setup. On the surface, surveillance cameras and security cameras have a lot in common. Both can help protect your home and let you review footage of situations like attempted break ins. The biggest difference comes with monitoring. Security cameras are continuously monitored in the event of a break in, fire, accident, or other issue, while surveillance cameras may be used for you to take a look at what your kids are doing in their rooms while you stay in the kitchen. Surveillance systems can be used to monitor your entryways and windows, and can also be monitored either by you on your smartphone or by a company if desired. Like any camera, your surveillance system will have a range of resolutions, and the one that you choose will ultimately be based on what you intend to use the system for. For example, if you’re using the system to monitor the interior of your home and to see what your kids are up to, you may not need as sensitive a system, while a camera mounted on your front door may need a clearer picture to give you the details of a potential burglar’s face. 700 tvl or higher is the recommended resolution for cameras mounted at doors and entry points; anything lower should be used strictly for interior home use only. Higher resolution cameras typically cost about $50 to $300 more than lower resolution versions. In addition to the camera resolution, you’ll also need to pay attention to the field of view, or the range the camera has. Most systems are designed to give you a range of 15 to 40 feet, allowing you to track movement inside the rooms of your home, as well as the area surrounding your front door. To see further than 40 feet, you will need to purchase a camera that has a long-view lens. These lenses often give you the ability to change the view or the scope from the monitoring device, giving you more detail and allowing you to cover a greater area. Prices increase dramatically for this type of system, with many long-lens cameras starting around $1,000. Surveillance systems were once hardwired only, requiring significant costs for installation, including running wires throughout your home. Today, while wired cameras still exist, the vast majority of the systems being installed are wireless, using either wifi or bluetooth technology. Wireless systems can often be installed DIY or for considerably less per camera, while wired systems tend to cost around $75 per camera installation, with a minimum of 4 cameras usually being put in at the same time for a cost of $300 for installation only. Three types of wires are generally used for these types of systems Cat5, Siamese or Coax. The cost of the cabling itself runs around $250 for 1000 feet. If your home is already wired for ethernet 1, this can help cut down on the costs considerably, while running the wire itself can cost up to $1,000 in addition to the camera installation and cabling, for a total of $2,050 for a wired system, versus the more common costs of $300 for a wireless. While wireless cameras are considerably cheaper, it’s important to keep in mind that they are also more vulnerable. They can be easily disrupted, while wired systems may be more stable. However, as technology improves most companies and homeowners are making the switch to wireless systems. When it comes to home security systems, one of the benefits is the ability to watch the footage again later in the case of a break in. Professional monitoring includes this storage in their monthly fee, but for home monitoring-based systems, you will need some type of storage. There are two general types: local and cloud. Local storage systems usually involve some type of SD card, which is placed inside the camera, and on which you can store or write over again in the future if need be. The cost is minimal, $10 to $20 per card with up to 128 gigs of storage. No other equipment is needed. Cloud based storage is another option, which means you don’t need to deal with equipment; the video is uploaded directly to the cloud. For this service, you typically pay a monthly fee of around $10. Surveillance systems exist for both interior and exterior use. Some will also provide you with mixed use cameras that can be used both indoors and out. Generally, cameras meant to be installed outdoors will have longer range and better resolution. They’ll also cost more, about $100 per camera on average, than those designed strictly for interior use. Continuous monitoring is not the only way that a surveillance system can work. You can also install cameras which turn on only once they sense movement. This can help cut down on the operating costs of the camera, including electricity or battery power. Motion sensing cameras can send an alert to your security company or your smartphone app when they are triggered, allowing you to get a feed just at the moment you need it, rather than all the time. These cameras may actually be less expensive, as they are not meant to be recording at all times, and typically run between $15 and $35. Many people opt for professional monitoring for their surveillance system, but this isn’t the only way that you can see what’s going on in your home. Remote viewing is available from most smartphones or tablets via an app. This enables you to view your kids while you’re at work, or to check in on your front door without going to the window when the doorbell rings. Most cameras today come with built in remote viewing apps. There are several different options for cameras today in addition their features and the way that they’re installed. In addition to the type of camera box or housing that you choose, you may want to look at one of these top 10 brands. Ultimately, the installation process you undergo will depend a lot on the location of your system, whether you opt for wired or wireless, and the type of camera you buy. In most cases, you will want to make sure that you install the cameras high enough to avoid vandalism, and in an obstruction-free area to give you the maximum field of view. If installing your cameras outdoors, place them under shelter to avoid precipitation whenever possible. Depending on the camera, you may need to take into account any nearby sources of light as well, as some cameras work better without direct glare. In most cases, the installation process will begin with connecting the cameras either to their power source or to the network. If using cables, this may involve significant wiring of your home if you do not already have an ethernet cable installed. For wireless setup, the process is easier and the cameras can be connected remotely in minutes. The cameras are then positioned and secured to their final locations and tested. If you are using remote monitoring over a laptop or tablet, this will be the final step in installation as you set up the app. The labor for the installation of your system will also vary depending on several things. If you are having a professional monitoring system, many will include the setup and labor fees in their initial contract, which normally includes first and last month’s payments up front, around $60 total. However, if you choose to have a company set up your system for you, the cost runs between $75 and $100 per camera, with most people opting for a minimum of 4 cameras per household. The costs range depending on whether you are setting up a wireless or wired system, and the location of the cameras themselves. If you are using a wired system, having the wires run inside the walls can give you a more aesthetically pleasing setup. The cost for this is usually higher, running up to $1,000 depending on the length of the wire. Some cameras with built in apps will have an option for lighting that you can turn on via remote control or the app itself. This can help you see the area better over your monitoring system. Generally, these cameras cost between $20 and $50 more than comparable cameras without the feature. Some cameras may also have a built-in microphone. This can be useful in security systems, as it can assist the police in finding a perpetrator. Microphones generally add around $20-$35 to the cost of the camera. Mini cameras are also available that you can simply set on a window ledge or piece of furniture for interior monitoring. They cost around $30 each. Having a licensed professional install your system can help guard against mishaps; most carry their own insurance against potential issues. While you can get a break on your homeowner’s insurance for having a surveillance system installed, most insurances will only cover you with professional monitoring and installation. Many cameras are available with night vision at no extra charge. Be sure to check the camera for its list of attributes to find out if the one you’ve chosen includes this option. While some cameras have a built-in battery, they aren’t good for continuous use. Unless you use a motion-activated camera, having an outlet nearby can help. In most states, it is legal to install a hidden camera with audio on your property. However, in some situations, audio may be considered wiretapping, and could be illegal in your state. Check your state code before installing a camera with audio built in. Speak to your monitoring company or installation professional about your needs to find the right camera system for you. Most cameras with in-home monitoring allow you to view the feed on your tablet or phone for no cost. However, some professional monitoring companies may charge an extra fee of $10 a month for you to view the same feed yourself. Check with your company to find out more. DIY installation of 4 cameras wirelessly is very common, costing only around $240 for the whole setup. The costs associated with a home security system vary by size and type. However, most people spend around $300 per camera. How much does it cost to install a CCTV camera? The installation costs for a CCTV camera are around $75-$100 each. However, with cabling, the costs could increase by as much as $1000 for the total system. How much does a security system for a business cost? The costs of a security system for a business run around $300 per camera installed, plus monthly monitoring fees of around $30. How much does it cost for a home alarm system? The average cost of monthly monitoring is around $30, while the initial setup costs will run between $500 and $1,000. The cost to install a video surveillance system is around $300 a camera. How do you install a security system? Every security system is different; your best option is to contact a professional who can assist you in choosing the right one and getting it set up properly. However, you can find wireless cameras that you can link to your tablet to monitor your front door or another area of your home in a DIY setup. How much does it cost to install video surveillance cameras in my city? Cost to install video surveillance cameras varies greatly by region (and even by zip code). To get free estimates from local contractors, please indicate yours.